Our new Pork, Peas & Wild Boar recipe adds a healthy variety to your dog’s diet with novelty meats rich in protein. For all stages of life, Supreme Source® provides advanced, grain-free nutrition for dogs who deserve only the best. Sourced from trusted, passionate farmers, our premium ingredients provide all the vitamins, protein and antioxidants your dog needs to thrive. A rich, lean protein with essential B-Vitamins and zinc that may help support your dog’s natural defenses. A unique protein that may help support your dog’s muscles and organ function. Pork, Pea & Wild Boar Recipe Dog Food is rated 4.9 out of 5 by 9. Rated 5 out of 5 by Donna A from Excited, owner and dog I just gave Wolfie some on the outside of his standard Salmon premium food, also no grain. He carefully ate just your tiny kibble first! We are delighted with the ingredients and will add our few ounces of home cooked meat. He would not eat “fat boy food” as recommended by the vet. A corgi can be very determined to eat only what they want and he is just a few pounds overweight. Thank you! Also, easy to purchase at Giant or Acme. When it stops raining we will walk the weight off. Rated 5 out of 5 by Gwen from Love in a Bag!! Angel baby loved this food, she practically pushed the bag out of the way to get the food pouring into the bowl she liked it so much. She has passed on, but her little buddies Jack and Dandy Lion love it just as much as she did, they are my little trouble makers, they are allergic to grains and wheat and need this kind of food. I've tried a ton of others, but they like this Supreme Source the best and this is their favorite flavor. The other brands have additives that make the food bitter and unpalatable, not Supreme Source, this food has become my dog's favorite food. Try the dog biscuits as well, my dogs think Christmas has come when I get the treats out, they love the biscuits so much!!! Rated 5 out of 5 by BabySquirrel25 from Our cats/dogs love it! After recently finding out our 2 dogs had allergic reactions to corn found in other food, we decided to switch them to a grain free food. After looking at other brands they were very pricy and not affordable. Then we found this food, not only is it cheap but it's affordable and the animals can't stay away. It's the perfect size for our kittens to eat and I like the ingredients in the food itself. With so many different flavors we can't just pick one flavor to stick with, so we mix it up. Hope this helps you decide to change food! Rated 5 out of 5 by Harv614 from My very picky Boston Terriers Love the new flavor! Our vet recommended grain free kibble for our rescued Boston Terriers but they are so picky that we were not having any luck finding a brand they’d eat. Until we found yours, with the exception of the salmon, they’ve loved all of the flavors especially the Pork, Duck & Lamb. Thanks for making meal times easier. Rated 5 out of 5 by Olga from Coupon Impossibility My four dogs absolutely love Supreme Source and we buy at least a bag every week. Unfortunately, every time I try to print a coupon, I get an "Oops, you have exceeded number of coupons". HOWEVER, I can't even print one! Thanks for the Mother's Day fiasco. Rated 5 out of 5 by SOFTBALLMOM from My dogs absolutely love this!!! My dogs (and I have 3 of them) love this flavor and the grain free helps keep their stomachs on check. This is one of the very few dog food brands their stomachs can handle. Rated 4 out of 5 by tjazzy0 from My dog liked this food Bought this food only because I had a coupon but my dog really enjoyed it so I will be buying it again !!!! ADULT: For adult dogs feed once or twice daily. May be fed dry or moistened with water. Use the table above and adjust to maintain body weight. Always provide fresh clean drinking water for your dog. Pork, Peas, Lamb Meal, Lentils, Wild Boar, Faba Beans, Pea Protein, Ground Flaxseed, Dried Plain Beet Pulp, Tomato Pomace, Pea Starch, Brewers Dried Yeast, Poultry Fat (Preserved with Mixed Tocopherols), Natural Flavor, Salt, Dicalcium Phosphate, Salmon Oil (Preserved with Mixed Tocopherols), Taurine, Organic Dried Seaweed Meal (Ascophyllum nodosum), Calcium Carbonate, Betaine, Choline Chloride, Carrots, Blueberries, Cranberries, Spinach, Parsley, Pomegranate, Vitamin E Supplement, Zinc Oxide, Zinc Proteinate, Ferrous Sulfate, Manganous Oxide, d-Calcium Pantothenate, Vitamin A Supplement, Riboflavin Supplement, Copper Sulfate, Manganese Proteinate, Thiamine Mononitrate, Pyridoxine Hydrochloride, Calcium Iodate, Vitamin D3 Supplement, Menadione Sodium Bisulfite Complex (Source of Vitamin K Activity), Copper Proteinate, Folic Acid, Biotin, Sodium Selenite, Vitamin B12 Supplement, Cobalt Carbonate, Mixed Tocopherols (Preservative), Citric Acid (Preservative), Rosemary Extract. 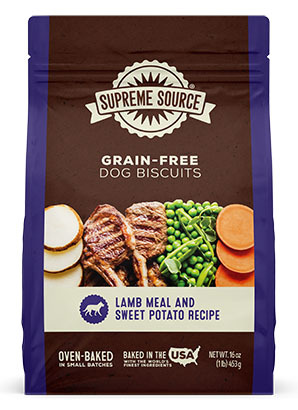 Supreme Source® Grain-Free Pork, Pea, and Wild Boar Recipe Dog Food is formulated to meet the nutritional levels established by the AAFCO Dog Food Nutrient Profiles for All Life Stages, including growth of large size dogs (70 lbs. or more as an adult). Vitamin A 5,000 IU/kg Min. Vitamin D 750 IU/kg Min. Omega-3 Fatty Acids* 1.0% Min. Omega-6 Fatty Acids* 1.8% Min. CALCULATED CALORIE CONTENT (ME): 3,432 kcal/kg., 345 kcal/cup.